I struggle with this topic. This is America. One of the world’s richest nations. How can we possibly be dealing with hunger in America? And yet… we are. Did you know that 1 out of 5 kids in America are facing hunger every day? That’s nationwide. Let’s break it down even further. I live in the state of Arizona. In Arizona, 30% of kids struggle with hunger. THIRTY PERCENT! Out of school-aged kids in Arizona, 493,000 are receiving free or reduced-price lunches and only 46% of those are getting school breakfast. Translation? Most of these students will only eat ONE meal a day. At school. What about in the summer? It’s time to stop hunger in America. I know I’m only one person… but we can all do something to help make a difference. Kids who eat breakfast have a higher school attendance and are more likely to graduate high school. Twenty percent more likely, as a matter of fact! Those same kids are proven to go on to earn $10,000 more annually on average than their hungry counterparts. Additionally- these kids are less likely to experience hunger as adults. I suppose that we could assume that their children would also be less likely to experience hunger- stopping the cycle. If you read along regularly… you know that I’m on the Denny’s Brand Ambassador Team. But I’m not invoicing Denny’s for this post. I’m writing it because it’s an important topic… not because it’s on my editorial calendar or because I’m being paid to do so. Denny’s is one of many brands on a mission to end childhood hunger in America. They need our help. Every dollar we donate to No Kid Hungry is tax deductible. That dollar can feed a child up to 10 healthy meals. All proceeds go to Share Our Strength’s No Kid Hungry, a campaign that ensures every child in America has access to free and nutritious food. Donate $3 and receive up to $9 of value (in coupons) on all your Denny’s diner favorites. 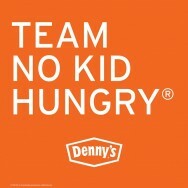 Visit nokidhungry.org/dennys for more information. And tweet with us at #DennysNKH and #NoKidHungry. Join me in doing this one small thing to make a difference.